A very simple dish, popular with all generations of the family and reasonably healthy too. Cheaper than chips if catch your own. 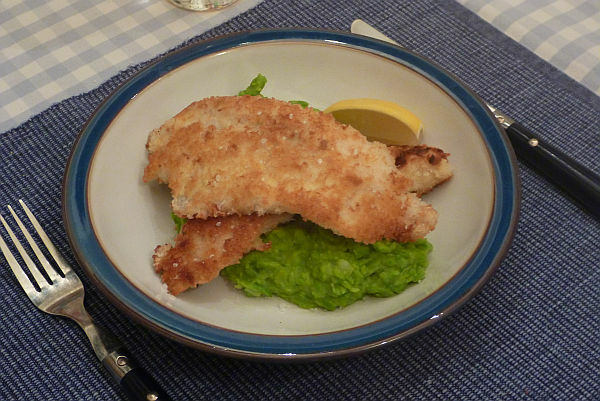 You can make this with whiting, large pout, pollack, dab, plaice or cod. The mashy peas recipe means you don’t have to do spuds as well but if you feel like a feast go for chips too. The mashy peas take longer so get these chaps going first. Peel the potatoes, chopped into sugar cube sized lumps and put in boiling salted water, After five minutes boiling gently, add the peas, and if you fancy, add the florets from the broccoli. I have tried with and without, both are good. After another 10 minutes, drain the water off, add a knob of butter and a splash of milk, Mash it all up with a potato masher, adding a bit more milk if it is too stiff. If you over-do the wet stuff you can rescue it by stirring over a gentle heat and letting the excess steam off (unless you have been really stupid). Season if it needs it with more salt and white pepper. You could add a dash of mint sauce if you like it minty. Keep warm while you do the fish. Zap the bread in a blender or food processor to make an impressive pile of crumbs. Beat the eggs. Take a frying pan and put a generous glug of oil in the base, covering it to a couple of millimetres depth. Heat it to medium temperature. Lay out your assembly line, starting with a plate of fillets, a plate with your egg in, a plate of crumbs and then your pan. Working like a good ‘un, dip each fillet in the egg covering both sides, ditto the bread crumbs, it is OK to pat more crumbs on, then lay the fillet in the oil. Repeat the sequence until you run out of room. You could either use two pans or do this in two batches. If it all fits in one pan you have been mean with the fish! By the time you have put the last fillet in the pan you will need to turn the first fillet which should have browned nicely, then every few seconds turn the next one, and so on. Total cooking time for average fillets is 3-4 minutes. A fish and chipper would serve peas, chips and fish next to each other on a plate. A posh restaurant would charge five times as much, would lay the fish on the mashy peas and serve the chips alongside in a miniature tin bucket. Seen it done – both were good. Mashy peas idea from Jamie Oliver, fish recipe from my Mum.